Apple CarPlay allows you to use your vehicle’s infotainment system to mirror the interface on your phone, and millions of iPhones are already equipped to use it over a wireless connection. Too bad Volkswagen was blocked from showing it off during this year’s Consumer Electronics Show. We wanted to demonstrate wireless CarPlay and the owner of CarPlay technology didn’t allow us to. Now Volkswagen knows the pain I feel whenever I want to manually manage the music on my phone, which it thinks was synced with a computer that I got rid of before I bought the stupid thing. The struggle is real. Wireless CarPlay requires iOS 9, and no automaker’s system currently supports it. 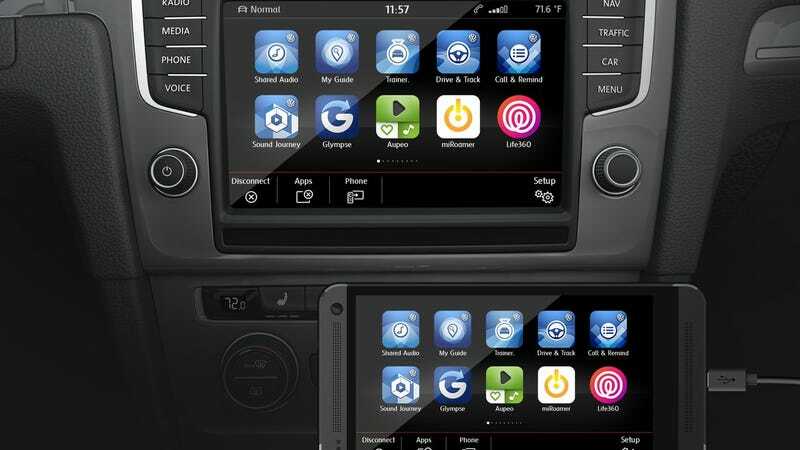 Of course, Volkswagen would want to show off theirs if it works because until now, Apple CarPlay has had to connect to a car through a USB port, and that’s so 2013. We don’t know why Apple blocked Volkswagen here, but it’s likely because Apple wants to show off its latest and greatest tech on its own terms, not on Volkswagen’s. C&D suspects that Apple will hold the formal debut of the capability for its World Developer Conference, one of their keynotes, or another Apple-centric event. Alternately, they could choose any number of automakers they’ve partnered with for the debut, but even then, there’s still the theory that Apple wants to maintain control of their own reveals. Since these wireless systems drain phones’ batteries quickly, Volkswagen representatives told Car & Driver that they expect the system will be paired with wireless charging for maximum usefulness.